"This organically crafted ale has a delightful rich bronze colour and is distinguished by a full bodied character with crystal maltiness. A lovely delicate sweetness soon develops into a long hop finish through the traditional blend of hops. Drinkers will enjoy the real traditional values of this great smooth ale. 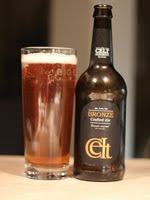 This beer is named after the Bronze Age Celts. Recent discoveries in Bavaria have shown Celtic tribes were brewing as far back as 800 BC. The name Bracis-Curmi (malted beer) traces back to the ancient Celtic language or proto-celtic, an age where Celts were some of the first beer producers in Europe." This beer pours a fiery orange in colour. Bronze-like with about one finger of fluffy white head. Medium sized bubbles with a decent amount of carbonation streaming from the glass. Definitely malty. Some bitter notes coming through. Not overly powerful. Slightly metalic. Some malt sweetness. light caramel.Slight bitterness to the finish. No big flavours here and a very light mouthfeel. Well it is a beer right? How bad could it be? Perhaps better on a hot day. There are no outstanding flavour points here. This is decent, but with so many great beers, I would probably not have this again. C+ at best.